“Policy & Internet” just published Pascal Jürgens’ and mine paper “The Political Click: Political Participation through E-Petitions in Germany“. In the paper we take a look at the German e-petition system and its usage dynamics. Abstract: Electronic petitions can serve as an influential mechanism for political participation. We present a study on the dynamics in the German e-petition system which was introduced in late 2008. Drawing on a data set of signatures, we analyze four aspects: (a) the types of petitions found, (b) the temporal dynamics of petitions, (c) the types of users found, and (d) the intersection of different petitions’ supporter populations. We present evidence that (a) the system is dominated by a very small number of high-volume petitions and (b) these high-volume petitions have a delayed boosting effect on the base activity in the petition system. We furthermore (c) present a typology of users, showing that although highly active “new lobbyists” and “hit-and-run activists” exist, one- or two-time petitioners have the largest impact. Finally, it is indicated that (d) many of the high-volume petitions share a significant part of their user base, hinting at a complex, topically motivated network of supporters. Through the application of methods from what has been called “Computational Social Sciences,” we illuminate a highly relevant field of political behavior online, while demonstrating the capability of data-driven approaches in such novel domains. A copy of the paper is available on the website of the journal. Jungherr, Andreas and Jürgens, Pascal (2010) “The Political Click: Political Participation through E-Petitions in Germany,” Policy & Internet: Vol. 2: Iss. 4, Article 6. With Pascal Jürgens [@pascal], and Harald Schoen I wrote a short blogpost for “Politik nach Zahlen“, a blog focused on empirical research on elections, hosted by the German newspaper Die Zeit. 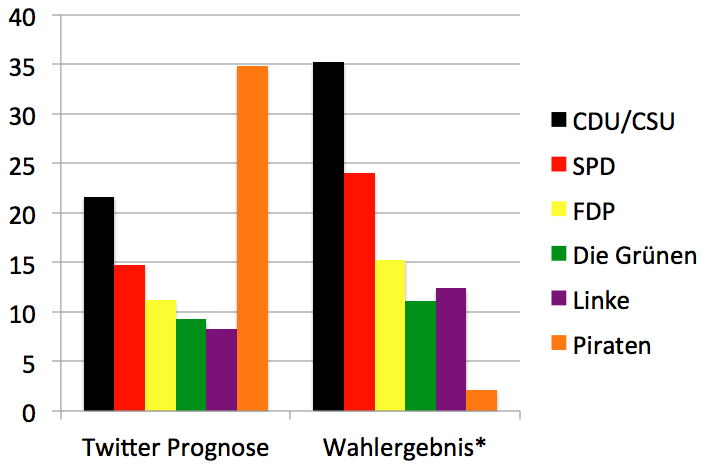 In “Twitterprognosen, oder: Warum die Piratenpartei beinahe die Wahl 2009 gewonnen hätte” we addressed the claim made by Andranik Tumasjan, Timm O. Sprenger, Philipp G. Sander, and Isabell M. Welpe in their paper “Predicting Elections with Twitter: What 140 Characters Reveal about Political Sentiment” presented at the AAAI Conference on Weblogs and Social Media, that Twitter would serve as a valuable instrument in forecasting election results. In their paper they found that the mentions of political parties on Twitter during a given time interval would closely mirror the election result. As the embedded diagram shows our results were not so encouraging. While researchers of online communication or internet enabled social behavior strongly believe in the growing importance of the internet and its significant effect on social processes this believe is not always shared by more traditional social scientists. But data speaks louder than beliefs. So who is doing regular studies on internet use in Germany and what are important one-shot studies? Here is a short list to get this started. But the more important question is: What studies have I missed? I’d greatly appreciate it if you’d add to this list in the comments. One of the probably most comprehensive sources of data on internet usage behavior in Germany are the ARD/ZDF Onlinestudien. Since 1997 the German TV stations ARD and ZDF regularly conduct a representative telephone survey with the aim of documenting the development of internet use in Germany. Since 2009 the results of the studies get regularly published in the journal Media Perspektiven. On their website you can find documentation on the ARD/ZDF Onlinestudien since 1997. Since 2000 the Forschungsgruppe Wahlen each quarter collects data on internet use in Germany in their report Internet-Strukturdaten. They base their reports on representative telephone surveys. They collect data on internet use, the demographics of internet users (i.e. age, education, occupation), the political preferences, political uses, and usage intensity. Another source for information on internet use in Germany is the Statistische Bundesamt. The Amt regularly publishes information on internet use in enterprises and private households. Also they publish data on the demographics and the way how the internet is used. Since 1998 the Medienpädagogischer Forschungsverbund Südwest publishes a yearly study into the media usage of 12 to 19 year olds in Germany called JIM: Jugend, Information, (Multi-)Media. In this study they regularly document the use of the internet by that demographic. The study is based on telephone interviews with approximately 1000 12 to 19 year olds. The studies are available for download on their website. Since 1999 the Medienpädagogischer Forschungsverbund Südwest also conducts regular studies into the media usage of 6 to 12 year olds in Germany. This study is called Kinder und Medien Computer und Internet. These studies are also availble for download.